LOS ANGELES – The United States in May filed an asset forfeiture complaint against an ancient mosaic depicting Hercules, believed to have been made in the 3rd or 4th Century, that likely was looted from war-torn Syria, allegedly illegally imported into the United States, and seized by the Federal Bureau of Investigation and Homeland Security Investigations at a Palmdale residence. The mosaic, which is approximately 18 feet long and weighs approximately one ton, was seized by FBI and HSI special agents in March 2016 as part of an investigation into the smuggling of looted items believed to be from a foreign conflict area into the United States. The complaint, which was filed in United States District court under the caption United States v. One Ancient Mosiac, alleges that a Palmdale man smuggled the antiquity into the United States with false and fraudulent documents with the intent to avoid import duties. A collection of ancient Roman artifacts that included a mosaic from one of Caligula’s Lake Nemi pleasure ships was repatriated to Italy on Oct. 20, 2017, following a multiagency investigation, which included U.S. Immigration and Customs Enforcement’s Homeland Security Investigations.. In September, the Manhattan District Attorney’s Office seized a section of ancient mosaic flooring pursuant to a search warrant and an ongoing joint investigation into the trafficking of stolen antiquities. The marble flooring section, which dates back to 35 A.D., was originally part of an ornate ship commissioned by the Roman emperor Caligula at Lake Nemi. Following the emperor’s assassination, the ship sank and remained underwater for nearly 2,000 years, until it was excavated in the 1920s. In 1936, the Ships of Nemi Museum was completed to display the ships and the items excavated from them, including the sections of the inlaid mosaic marble floor. 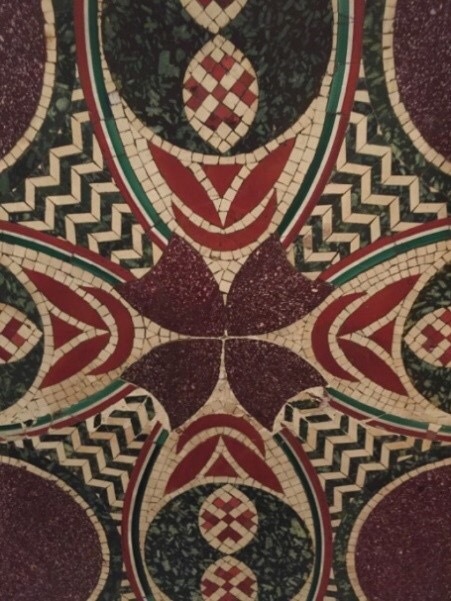 The Museum was later used as a bomb shelter during World War II and many of the original tiles were subsequently destroyed or damaged by fire, rendering the mosaic floor piece one of the only known, intact artifacts of its kind from the Ships of Nemi. Earlier this year and as part of the same investigation, the Manhattan District Attorney’s Office seized a Paestan red-figure bell-krater, a wide, round wine vessel circa 360-350 B.C., from the Metropolitan Museum of Art, as well as a Campanian red-figure fish-plate, circa 340-320 B.C., from a Christie’s auction. All the items were seized pursuant to judicially authorized warrants, but were thereafter forfeited willingly once the owners were presented with the evidence that each had been stolen from Italy. No word on whether 2,000 years at the bottom of a lake and a World War II bombing cleaned all the Caligula-era party grime from the mosaic floor. Also, ICE didn’t mention that the mosaic section had been found repurposed into a coffee table. Have you seen this man? 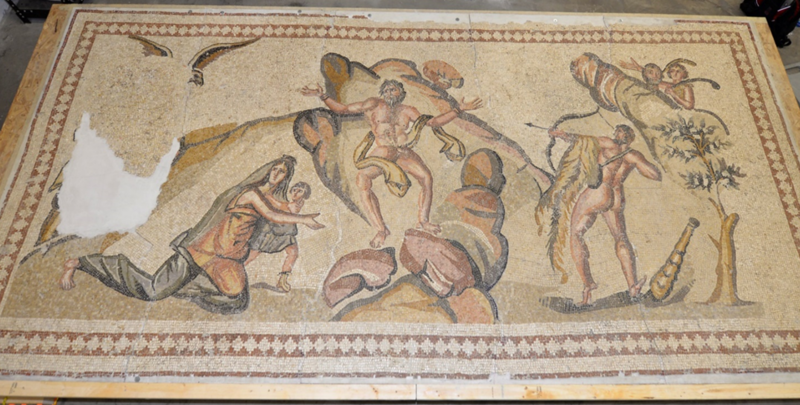 INTERPOL seeks help in tracking down mosaic pieces looted from tumultuous Syria. INTERPOL is throwing it’s weight behind the search for missing mosaic pieces and warning of threats to cultural artifacts as unrest continues in Syria, which is currently the fifth season of its Arab Spring uprising. “INTERPOL calls on the particular vigilance of its 190 member countries as to the risk of illicit trafficking in cultural goods from Syria and neighbouring countries,” officials with the international police agency said in a release this week (yes, they had the “U” in neighbouring). “Roman ruins, archaeological sites, historic premises and places of worship are particularly vulnerable to destruction, damages, theft and looting during this period of turmoil,” the release continued. INTERPOL’s general secretariat drew particular attention to mosaics stolen from the ruins of Afamya in the city of Hama, and said the agency will include information about stolen artworks and cultural goods in its database.